While we'd be hesitant to use the word "failure" in relation to Final Fantasy XIII, "disappointment" works just fine. If only Square had known people outside Japan wouldn't like the game before they released it! Oh, wait. They did. The latest issue of Game Developer magazine has a fascinating insight into the development of Square Enix's latest role-playing epic, which despite costing millions and taking years to develop, wound up letting many fans down thanks to its linearity and regressive game design. 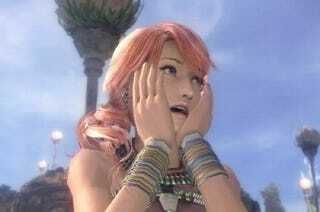 Just How Straight Are FFXIII&apos;s First Five~Six Hours? While there's talk of engine troubles and the lack of a creative vision for the game, most interesting is the developer's revelation that a decision to test the game in non-Japanese markets was only made at the 11th hour. "Even before the current generation of consoles was introduced, it was obvious that the game market in the West was gaining momentum, and we couldn't ignore it", write developers Motomu Toriyama and Akihiko Maeda. "The sentiment that stood out the most to us at the time was the increasingly harsh criticism towards JRPGs." "Linearity and command-based battles were two of the features being perceived negatively. This was something that the team was very conscious about, and there were concerns about whether JRPGs would still be accepted in the West. Because Final Fantasy XIII's mission was to succeed worldwide, we could not ignore this issue, as we felt it could deeply affect the future of the franchise." So focus testing sessions were held in Western markets. And they achieved...well, nothing. "Unfortunately, we were already quite far along in development, and knew it would be too late to implement most of the feedback from the player test sessions. Even so, we still signed up for the opportunity, as this would be our only chance before the game's release to see how Western players would respond to all that we had been working on." "There were some minor hiccups, as we did not have much time to prepare for the focus group sessions, but we were able to successfully conduct player tests and interviews globally. Even though it was too late to apply the majority of the feedback, most team members felt the tests were worthwhile, as it gave them insight into what players wanted globally." Despite feedback from Western gamers coming too late to make fundamental changes to the game, it still caused problems back at Square Enix, as the new information "resulted in conflicts within the team on whether it was worth forcing certain changes into an already tight schedule". What. A. Hot. Mess. And Square have nobody to blame but themselves. Even the most basic form of focus testing would have involved looking at how well-received Final Fantasy XII had been with Western media and consumers. How did they think scrapping the radical changes made to that title and reverting to a more traditional style of Japanese role-playing game would go down?